"Every one of the builders had his sword girded at his side as he built. And the one who sounded the trumpet was beside me. We attended this afternoon's RPT convention event with Gun Owners of America concerning the Second Amendment and the recent round of so-called "school shootings." The Texas house Freedom Caucus opened the discussion with a legislative update on Constitutional Carry. The short version is that a lot of politics happened last session. Matt Schafer also pointed out that firearms regulations are embedded all over Texas' various codes, so successfully eliminating them is more complicated than it looks. Schaefer also pointed out that firearms restrictions leave women in bad relationships vulnerable to the whims of their partners. Attorney General Paxton made the most interesting remarks. 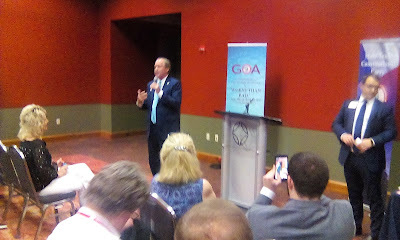 Paxton discussed how Israel does school safety better than any other country. During the 1970's following various "Palestinian" attacks on innocent schoolchildren, Israel implemented measures to assure competent armed guards are stationed at every school. Israel also allows armed teachers in classrooms. Following the implementation of these measure, Israel hasn't seen an active shooter event in a school setting in over 40 years. We've been meaning to point out that General Paxton is the only person talking sense about school security for a few weeks; we're glad to have this opportunity. Ted Cruz was scheduled to speak, but got stuck in D.C. His father spoke in the Senator's stead. Rafael Cruz explained how his experience in Cuba illustrates how an armed citizenry is necessary. Rafael Cruz also pointed out that Switzerland requires it's population to be armed and that it hasn't been invaded in centuries.